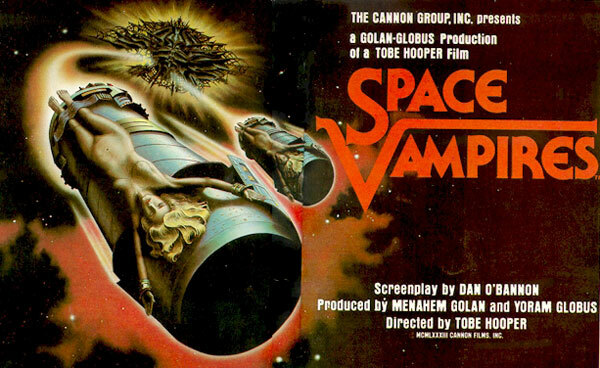 HORROR HOST BUNNY GALORE INTERVIEWS “SPACE MONSTERS” EDITOR AT BRITISH HORROR FILM FESTIVAL! 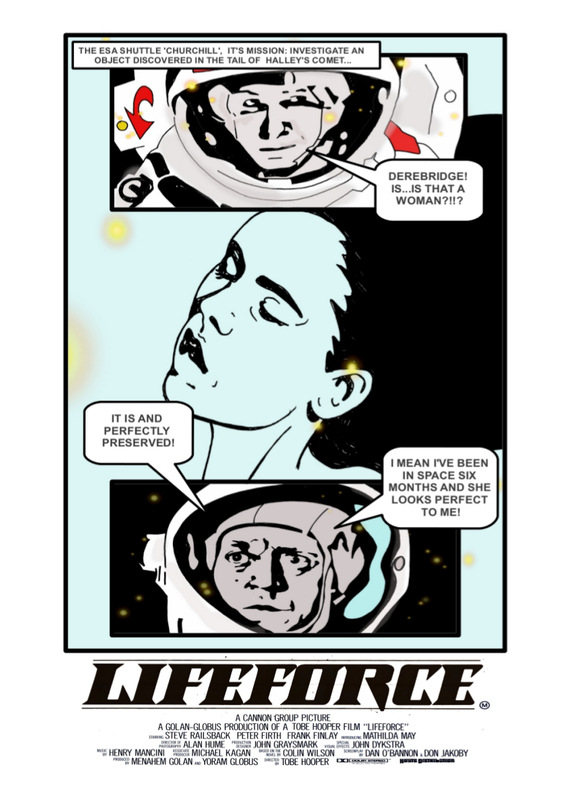 Space Monsters editor Cyberschizoid (A.K.A. Richard Gladman) was recently asked to join the panel of judges at this year’s British Horror Film Festival which took place at the Empire Cinema, Leicester Square on the 18th and 19th October and met up with Sky TV’s Horror Host Bunny Galore! 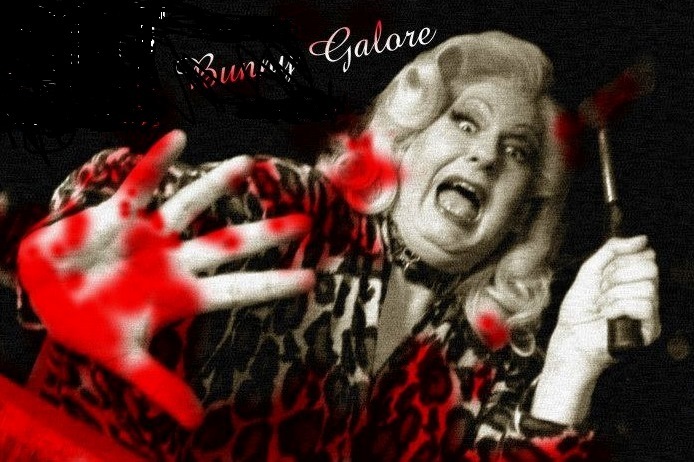 Not only does Bunny present cult movies, she also interviews horror film stars, directors and celebrities as well as being a burlesque singer at the Cafe de Paris in London and a veteran panto performer! 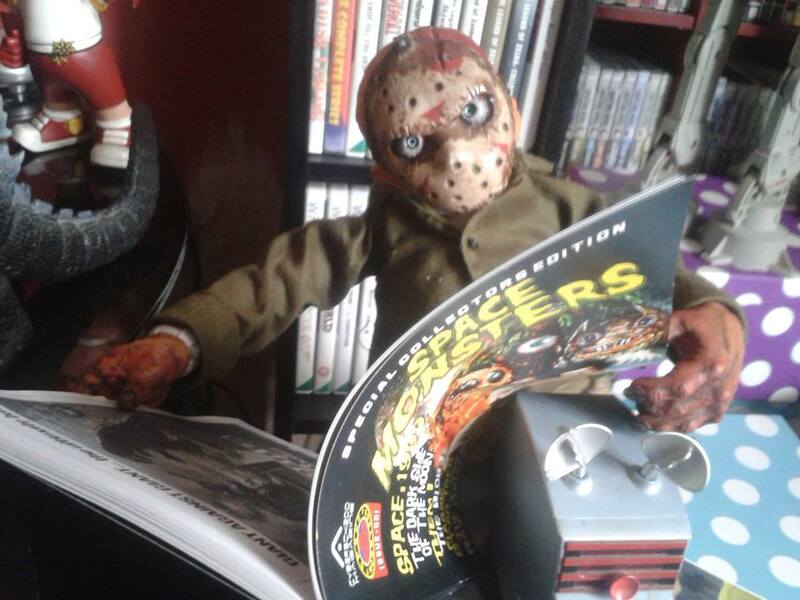 During the festival Bunny took time out to talk to Cyberschizoid about Space Monsters magazine and you can watch the interview below. 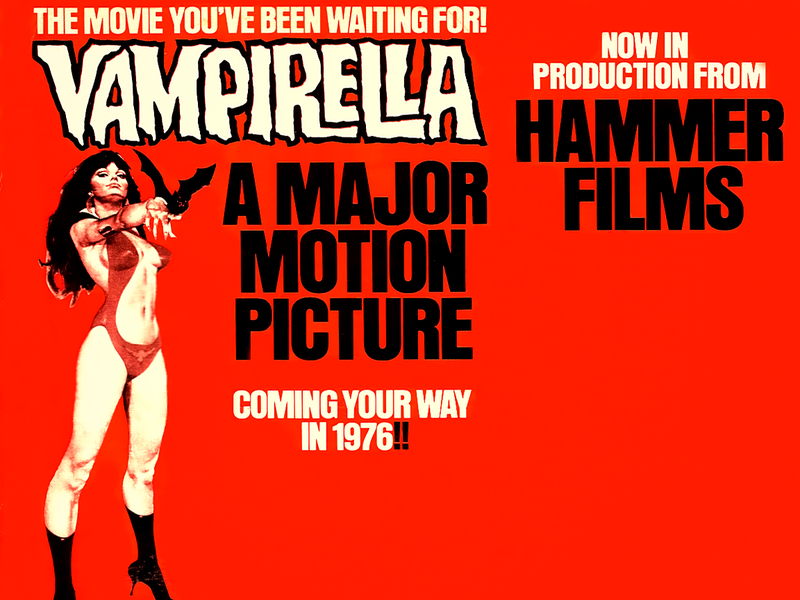 The segment also includes a chat with “Entity” director Steve Stone and “Serial Kaller” director Dan Brownlie. AAAAAAAAGGHHHH! 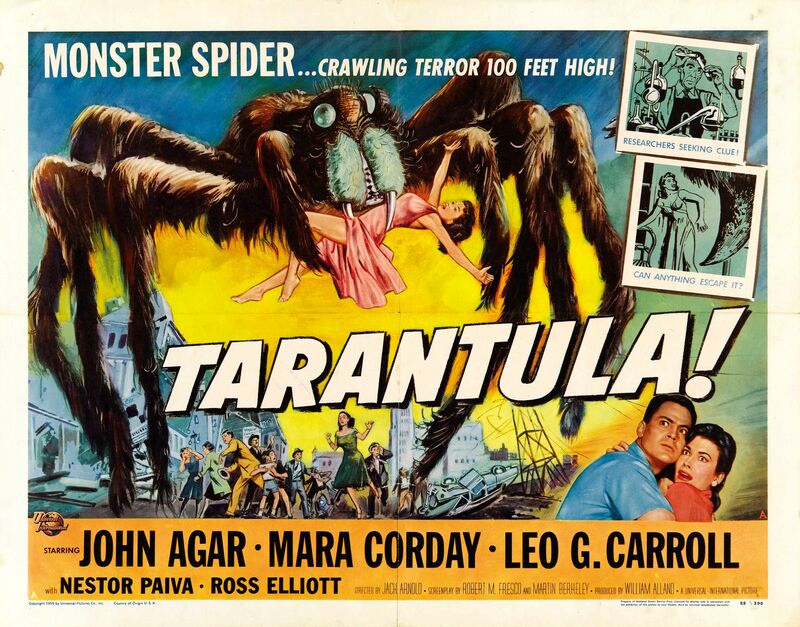 MARTIAN MONSTERS, A GIANT SPIDER INVASION AND MOON ZOMBIES! 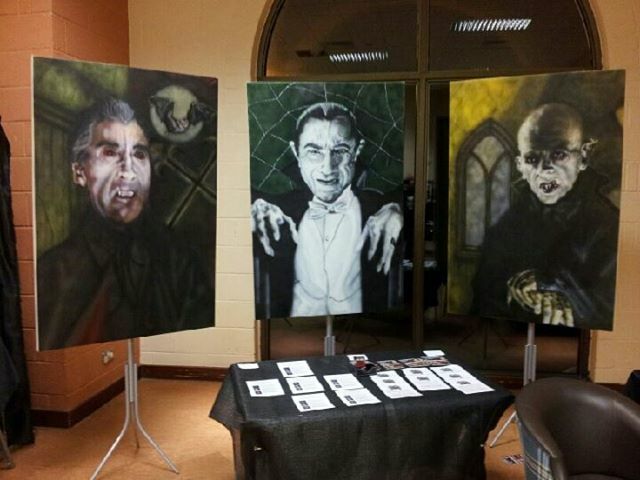 The Bram Stoker International Film Festival in Whitby is still in full swing with movie premieres, classic cult films and the Vampire Ball still to come tonight! 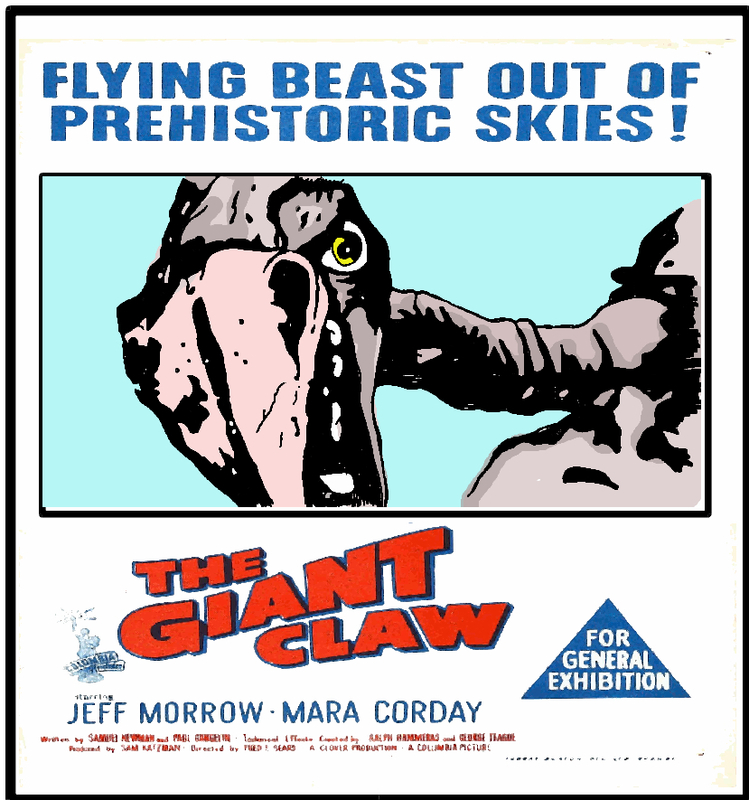 Tomorrow there is even more monster fun with the Dark Art Exhibition (downstairs), more movie premieres on the main screen and a whole bunch of classic b-movies in Sultan’s Sci-Fi Suite! 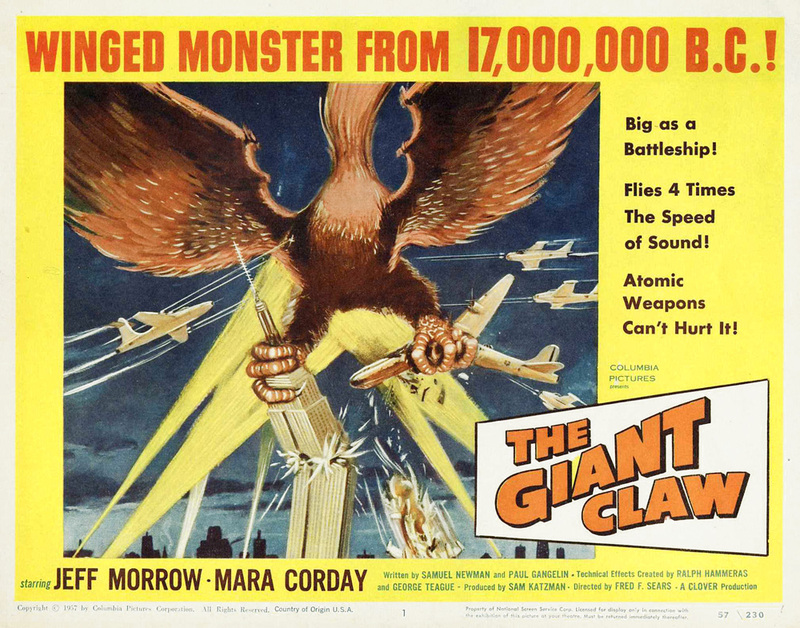 Here’s a run-down of the monster movies screening in the Sci-Fi Suite on Sunday 27th October from morning till night! 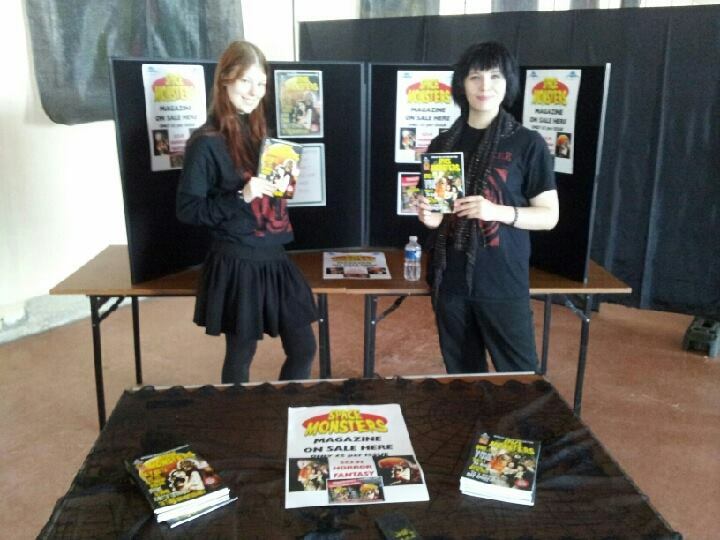 And don’t forget, Space Monsters Magazine will be available to buy downstairs at the Dark Art Exhibition! Be there…and be scared! FOR A LIMITED TIME ONLY! ISSUES 1 AND 2 MULTIPACK OFFER! 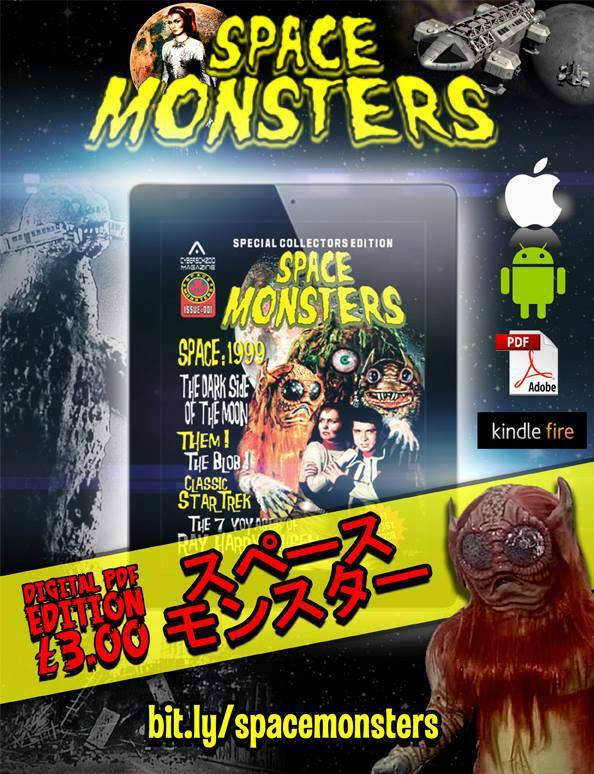 For a limited time only the Dead Good Newsstand is offering the digital versions of Space Monsters Magazine issues one and two together in a multipack deal – only a fiver for both issues! 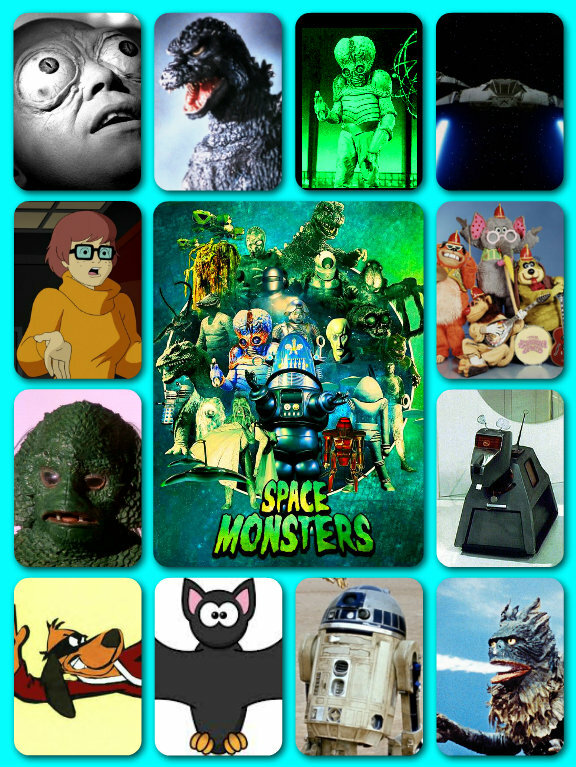 And that’s not all – the digital version of Space Monsters issue 2 is 80 pages of FULL-COLOUR monster madness! 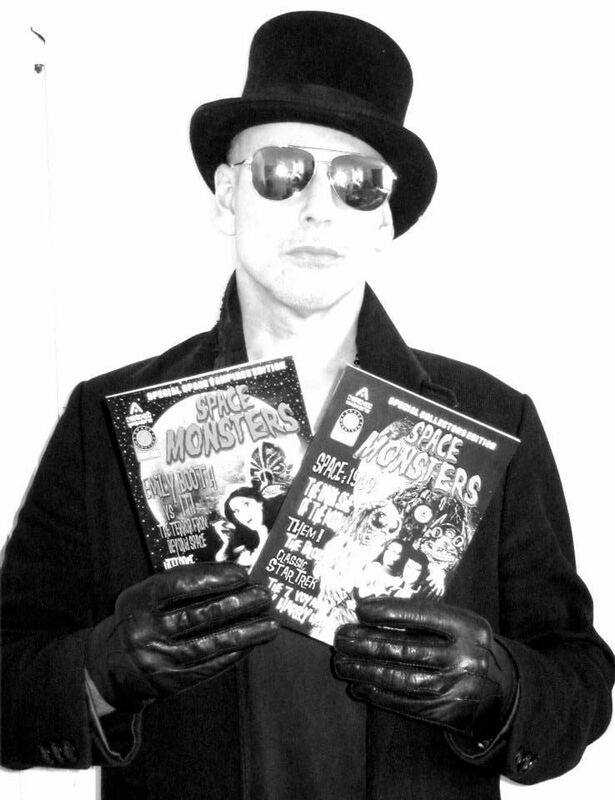 ORDER YOUR MULTIPACK OF SPACE MONSTERS ISSUES 1 AND 2 FOR JUST £ 5.00!! * BEWARE! THE BLOB! 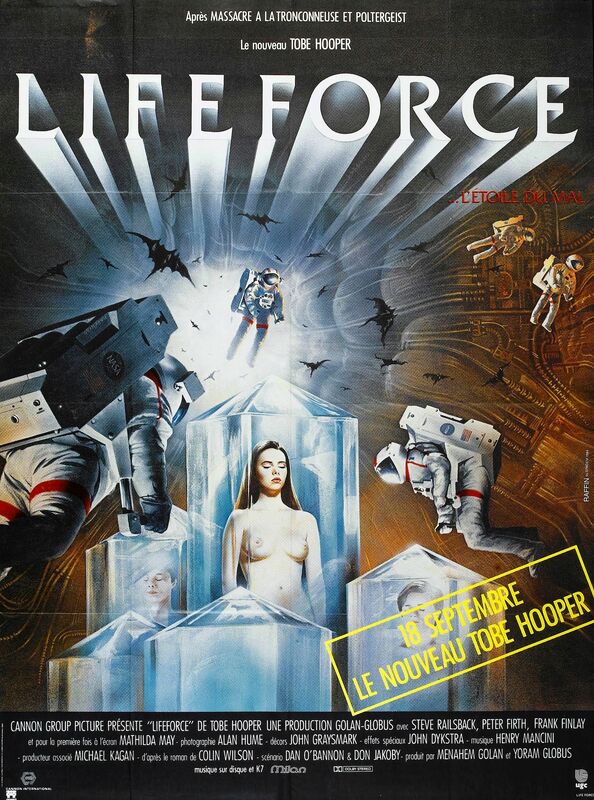 – A look back at the seventies B-movie! 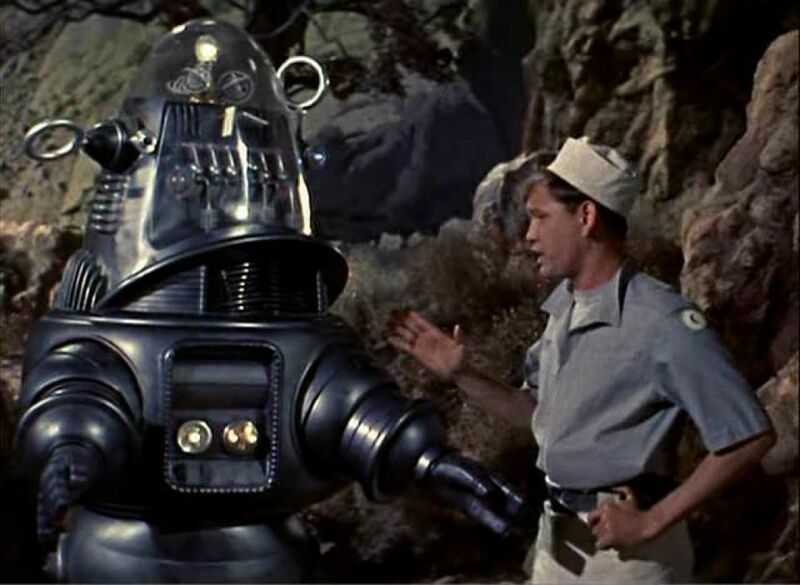 Do You Dare Take a Trip To The…FORBIDDEN PLANET!?! 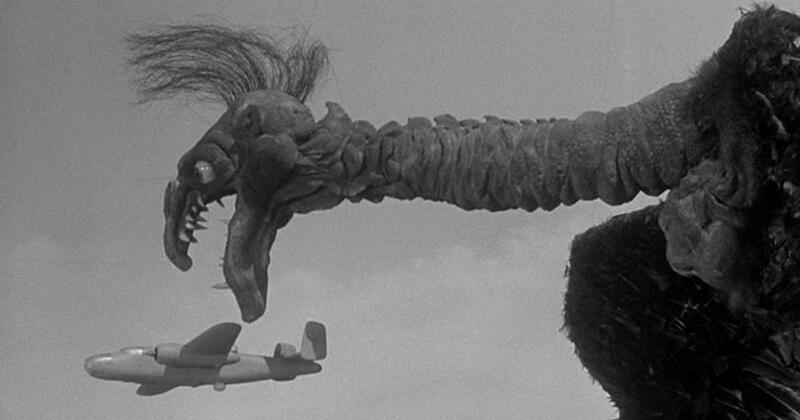 One of the most famous and much-loved science-fiction films of all time, Forbidden Planet (1956) will be screening at this week’s Bram Stoker International Film Festival in Yorkshire. 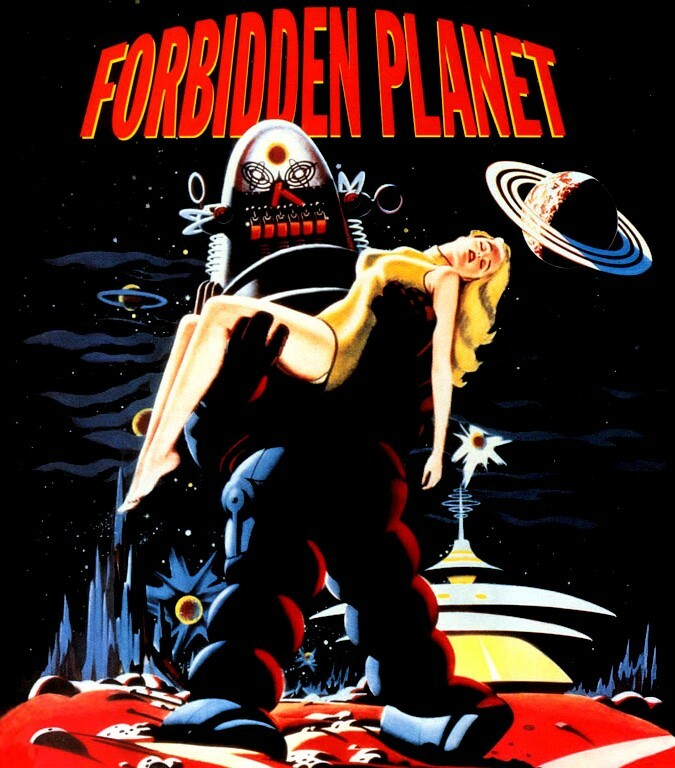 Cited as a big influence on Gene Roddenberry’s iconic Star Trek television series, Forbidden Planet is a cool combination of sci-fi spectacle, intellectual themes and creepy horror elements which still stands up as essential viewing today. 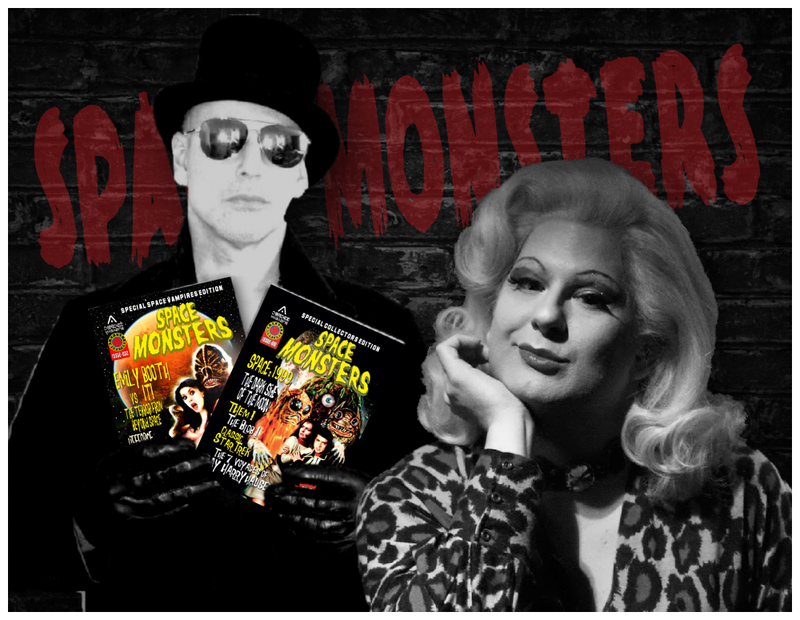 So join Robby the Robot, Space Monsters Magazine and Sky TV’s Horror Host Bunny Galore at the Bram Stoker International Film Festival from Thursday 24th – Sunday 27th October – tickets are now only available from the Bram Stoker desk, Thursday onwards at the Spa Pavilion, Whitby! WATCH OUT! 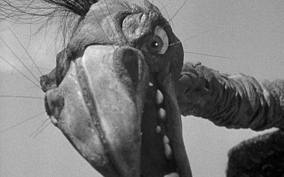 THERE ARE SPACE MONSTERS LURKING IN THE THEATRE! 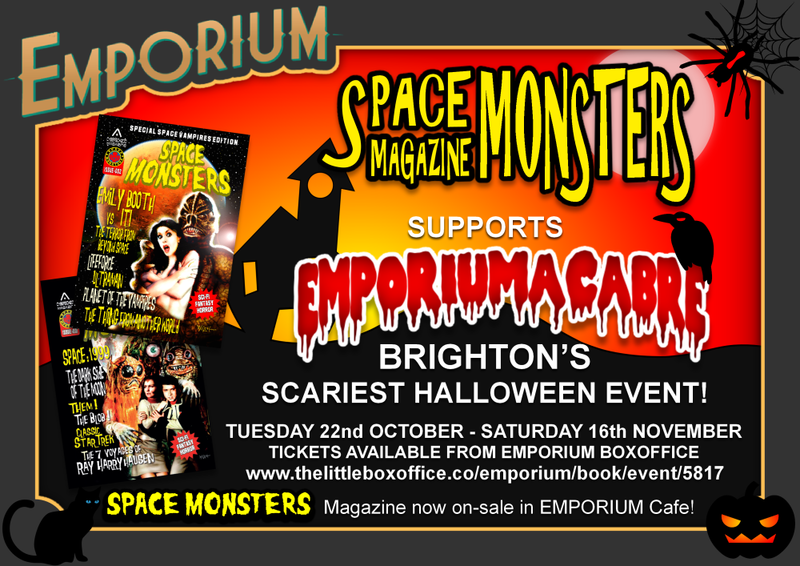 Space Monsters Magazine has teamed up with Brighton’s newest theatre and entertainment venue, the Emporium on London Road to support their chilling event Emporiumacabre which is set to frighten Brighton this Hallowe’en season! 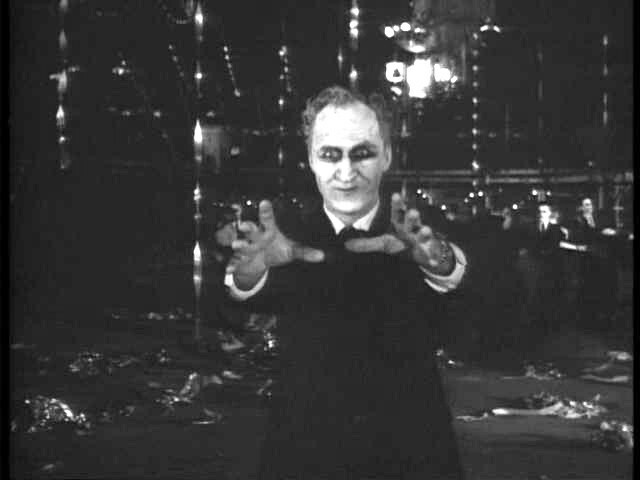 From Tuesday 22nd October to Saturday 16th November prepare to be terrified by a unique horror experience which revives the tradition of Grand Guignol and ghoulish ghost stories wrapped up in a theatrical anthology of things that go bump in the night! 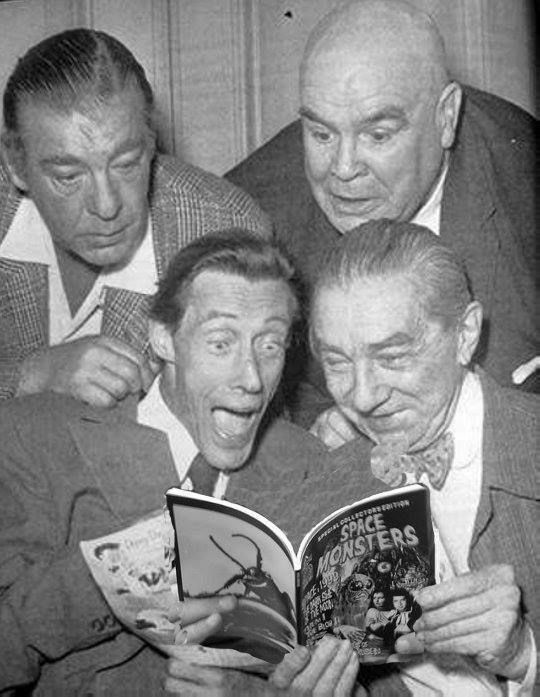 Emporium is open every day from morning till night and is now selling Space Monsters Magazine in their popular cafe alongside their delicious teas, coffee, home-made cakes and buffet-style lunches – talk about a monster munch! 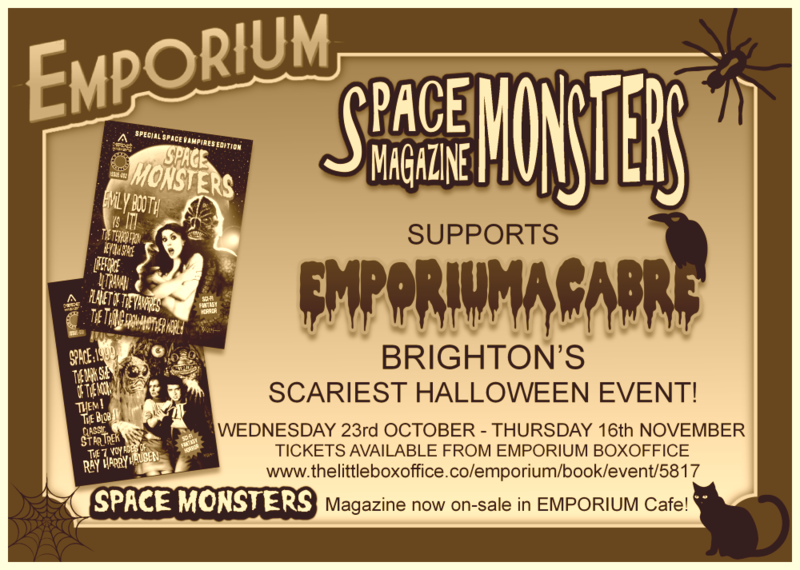 To buy tickets for the Emporiumacabre horror event just head to The Little Box Office – book now before they sell out! You’ll find Emporium at 88 London Road, Brighton, BN1 4JF so pop in and say hi – and tell them Space Monsters Magazine sent you! BUY TICKETS FOR EMPORIUMACABRE – JUST CLICK ON THIS LINK! 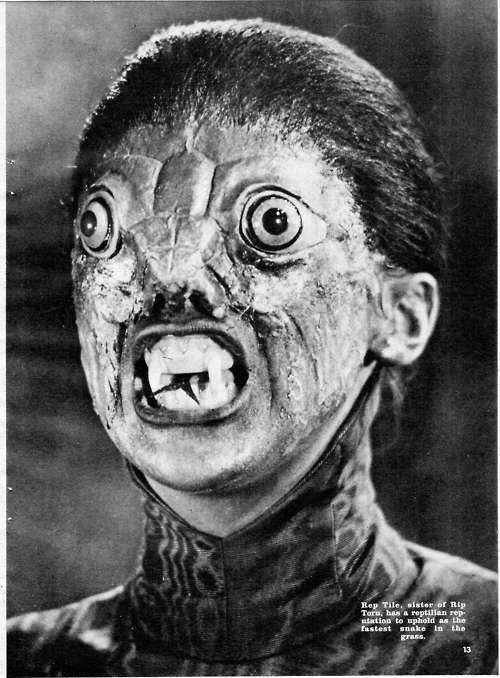 Space Monsters Magazine editor, Cyberschizoid (A.K.A. 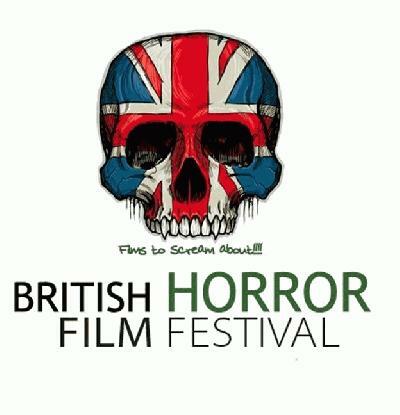 Richard Gladman) has been asked to join the panel of judges alongside media lecturer Doctor Karen (Classic Horror Campaign) Oughton and director Dan (Serial Kaller) Brownlie at this year’s prestigious British Horror Film Festival in London. With their scariest line-up yet, the new British Horror “Haunted: After Dark” awards and an after-party at the swanky Hippodrome, this is going to be one terrifying event! 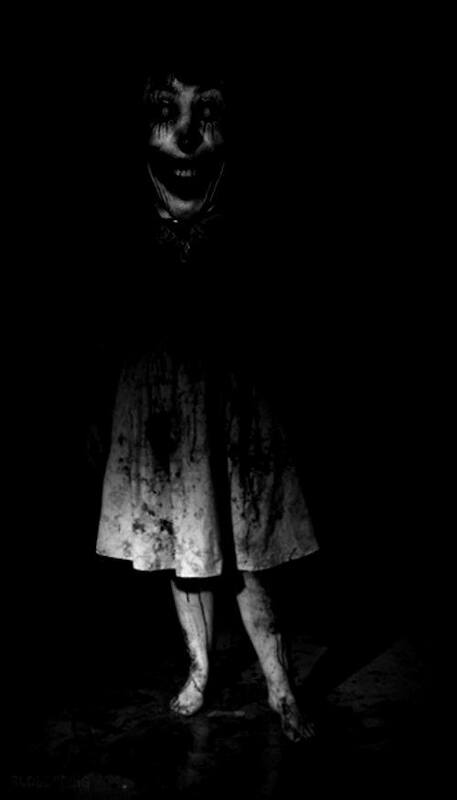 Be prepared for psychics, scary demons and Serbian ghosts keeping you up all night! YOU CAN BUY YOUR TICKETS FOR THE FESTIVAL FROM THIS LINK! 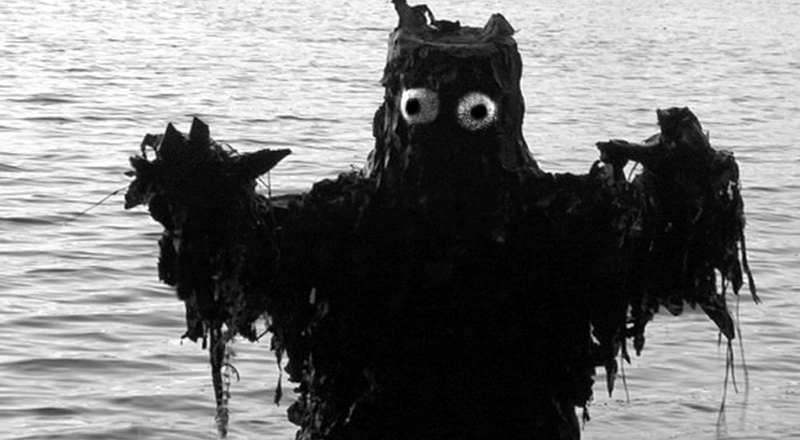 Here are the British Horror Film Festival nominations for this year’s awards. 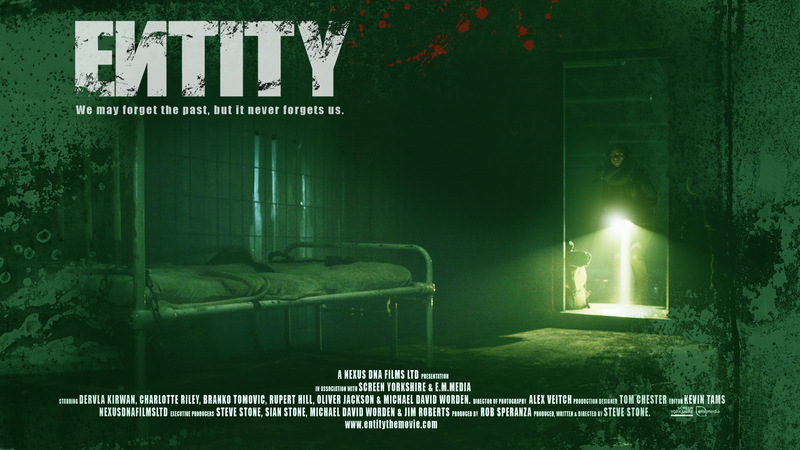 Steve Stone’s Entity starring Dervla Kirwan, Charlotte Riley and Branko Tomovic picked up nominations in six categories, including Best Feature Film, Best Director, Best Actor, Best Actress, Best Cinematography and British Horror Award. The Award Ceremony will take place Saturday 19th October 2013 at the glitzy Empire Cinema, Leicester Square in London.